In the last post I noted that monopsony is definitely not the only and not even really the best theoretical argument for why we see no disemployment effects. Commenters made this point too, including YouNotSneaky, who regularly highlights the limits of the dynamic monopsony model as an explanation. (S)he is correct that dynamic monopsony is not sufficient and does not automatically imply that a minimum wage will raise employment, but my standard is somewhat different than that. None of these explanations automatically imply anything, the question is whether they seem to be plausible explanations. 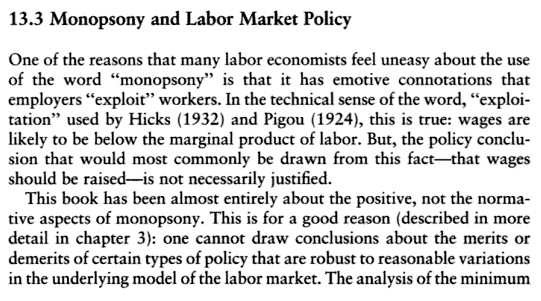 We have work that suggests there is monopsony power in low wage labor markets, and we know that under certain conditions (but not all conditions) dynamic monopsony can explain the no disemployment effect result, so it seems reasonable to me to keep it on the table. I'm not a theory guy so it would take some time to review and walk through the models, but there's plenty of material out there if you're looking for the conditions under which monopsony does and doesn't provide this result. Manning runs simulations on his model with Dickens and Machin on pages 340-347 in Monopsony in Motion and shows what parameters produce a no disemployment result and which ones produce a big disemployment effect. Critically, none of them show much of an effect when the minimum wage shock is small. Bhaskar and To (1999) have similar "it depends on the parameters" results, as do a few other papers. A lot of this doesn't just depend on the parameters but the source of the monopsony power itself. Search models seem to be more problematic for getting the result than product differentiation models (I noted both sources of market power in the prior post). 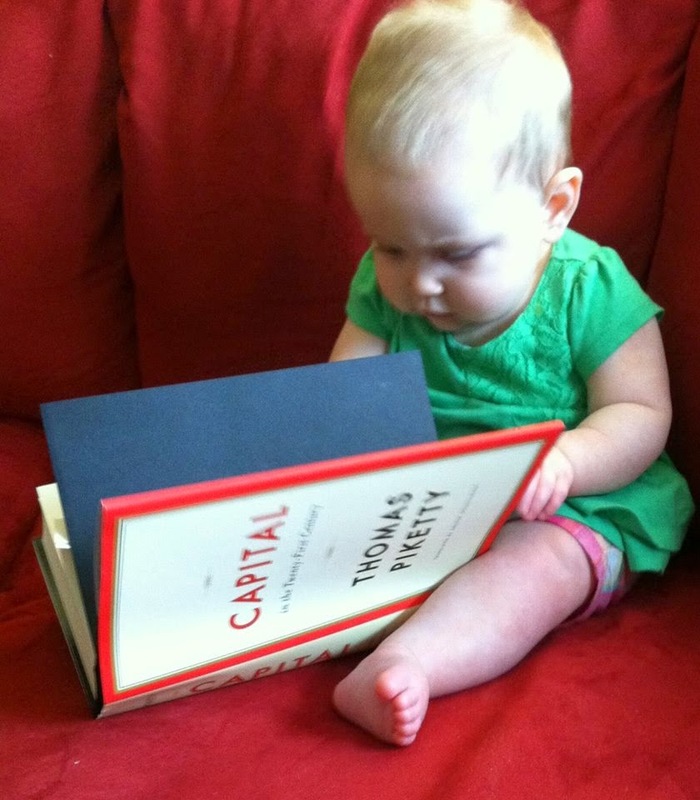 YouNotSneaky is particularly interested in what monopsony can definitively tell us. 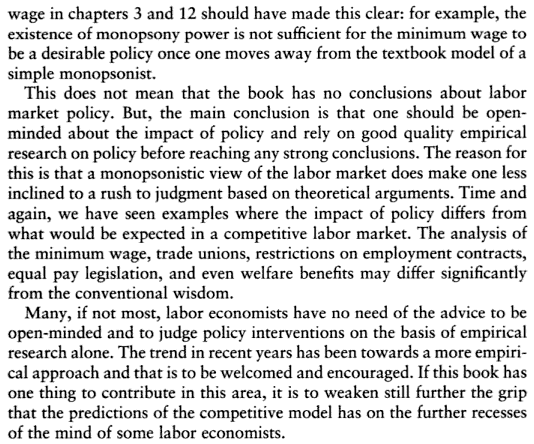 I come at it from the other direction: when I see good studies showing no disemployment effect my conclusion is that I have to accept monopsony (with the right parameters) as a decent candidate explanation to keep on the table. Finally, I wanted to bring attention to a new post from Don (and apparently more are coming) that I think is much stronger than the prior posts. He notes that if we think that firms exercise market power over their workers they should be able to price discriminate. If they can price discriminate it gives them some latitude to continue to higher more workers at higher wages and approach the competitive wage level for those new workers. The price discrimination capacity here is key because if the workes who are paid at (or I suppose "near" will work) their reservation wages increase their wages too then it's not a profit maximizing move to hire new workers up to the competitive wage. I think this is a really good and reasonable point. I also find it interesting because it (I think - this is just off the top of my head) provides a nice explanation for the spike in the wage distribution at the minimum wage that Manning suggests is a puzzle to a number of different models. The logic would be that before the minimum wage increase there are a lot of people employed for less than their marginal product, they're kept on when the minimum wage goes into effect because the increase is still less than their marginal product, but they're all now bunched at the minimum wage level until the curves shift again and the distribution smooths out. I'm not 100% sure if this actually works out but it seems sensible. Don Boudreaux has written a long post challenging me by name on monopsony power and the minimum wage. I've addressed all the points in his comment section before, although he does not speak to those directly. Rather than bury responses in another one of Cafe Hayek's comment sections I thought I'd provide them here. I'd encourage people not to take Don's word for what my claims have been - he says I've made a lot of claims that I actually haven't. So if you don't read me claim something please confirm with me that I actually think it before attributing it to me! The issue at hand is whether market entry can dissipate the monopsony power that is often cited as a reason why we don't see big disemployment effects associated with the minimum wage. Don has repeatedly asserted that people who don't think there are major disemployment effects should go out and hire a bunch of underpaid workers. They would enrich themselves and help low income workers. If they're not willing to do this, Don actually suggests that is evidence in and of itself against the empirical work! There are some obvious problems with this challenge, and Don seems to assume that entrepreneurship is a simple affair (he calls it "easy"). I disagree, but let's leave those issues aside. The question is, would mere entry even have any impact on the sort of frictions that we think cause monopsony power? I don't think so. If that was all it took, we wouldn't see much evidence of monopsony power. I'm going to tackle this in three parts: First, the nature of the frictions people normally point to, second examples of precisely what Don is looking for and what we expect from market entry, and third other sources of the disemployment result. Don't consider this an exhaustive list, but when we're thinking of the low wage labor market a lot of the frictions I generally have in mind are (1.) hiring and firing costs, (2.) asymmetric information about the worker's productivity, (3.) firm-specific human capital, and (4.) liquidity constraints and various other factors that make search costly for a low income worker. Competitive pressure from entry is extraordinarily important in the market process but merely entering a market doesn't obviously address these frictions. If I provide more demand for low wage workers I've done nothing to change the fact that the current employer of a high productivity low wage workers has private information about that worker's productivity that I don't have. Although this is less related to monopsony power, I also haven't done anything to change the asymmetric information between me and the worker herself about her productivity. In a sense you can think of the labor market (any labor market, not just the low wage labor market) as a market for lemons. Entry in the market for lemons does not fundamentally change the problem (neither, for that matter, does imposing a minimum price). The same goes for hiring and firing costs. Competition of course grinds down all costs to some extent but it doesn't change the fact that employment is going to be associated with fixed costs, and as Walter Oi pointed out decades ago (at the start of this dynamic monopsony literature) fixed costs associated with labor lead to workers being paid lower than their marginal product (similar insights structure Gary Becker's work on human capital). Firm specific human capital also gives your employer some control over you. Your know-how developed on-the-job is partly general but much of it is also specific to your employer. And again, if a competitor wants to make you equally productive they're going to have to make their own (fixed cost) investments in you. A lot of this has focused on the relationship with the employer, but workers in general - and low wage workers in particular - often face search frictions that contribute to their employer's monopsony power. Search is costly and it's particularly costly if you're a low wage worker. These workers face liquidity constraints, many are young and supporting families, and transportation limitations are likely to raise the costs of search. All of this reduces separation rates and contributes to an incumbent employer's monopsony power. Don is presenting a very naive/classic understanding of market power where it's purely a numbers game. Market power is caused by sparse markets under this view, so entry should solve the problem. I don't think this cuts it. For a long time - really going back to Edward Chamberlin at least - economists have understood that firms, products, workers, capital, etc. are not homogenous or undifferentiated entities. Product differentiation provides market power even when there are many firms in the market. The same goes with workers. The heterogeneity of labor leads to many of the asymmetric information problems I highlighted above. In these monopolistic and monopsonistic competition situations additional competition of course erodes market power, but it does not eliminate it. These are not just abstract theories - workers and capital really are heterogeneous and differentiated. When we do price theory, we can't just ignore that and construct more convenient models that don't acknowledge it. What might matter more for eroding monopsony power is entrepreneurship targeted at the sources of monopsony power. Innovation and entrepreneurship in private accreditation or other methods for revealing more information about workers' productivity or for connecting employers to workers could help. But mere entry into a market that employs low wage workers doesn't have any obvious benefits unless we simply have charity in mind (which is not Don's point). The ironic thing is we see examples of what Don is demanding in the news all the time. He seems so fixated on Paul Krugman (and, weirdly, me) that he doesn't seem interested in these cases as evidence. Costco, Wal-Mart recently, Trader Joe's, In-N-Out Burger, etc. are all regularly cited as doing what Don suggests. I think an interesting exercise would be to look into their hiring process because they may be innovating along the margins I've mentioned above. Another possibility is that these firms may be on a higher equilibrium in a multiple equilibrium. Labor economists often note important interactions between turnover and productivity that allow for the co-existence of low-turnover, high productivity and high-turnover, low productivity firms that are both profitable but at different equilibria. In any case, these are clear examples of what Don is looking for. I think when we think about entry it's important to remember that competitive pressure and entry threat is always operating and always pushing markets toward their equilibrium point - that's the market process - but there's no necessary reason for that to be a "competitive equilibrium" as it's defined by economists. Competitive pressures could push firms toward an equilibrium with market power too. In a sense it's unfortunate that the word "competitive" is even used to describe these cases, since competition is in play in all markets. Nomenclature often fails us, but that's no excuse for bad analysis. "There are many different explanations for the lack of substantial disemployment effects in matching studies. One suggestion is that employers exercise “monopsony power,” or bargaining power associated with being one of a small population of buyers in a market (an analog to the monopoly power exercised by sellers). Just as a monopoly will not reduce its output in response to an imposed price reduction, a monopsonist can absorb a price increase (such as a minimum-wage increase) without reducing demand for workers. Although such theoretical explanations are possible, a more straightforward argument is that an increase in the minimum wage does not have a disemployment effect because the increased labor costs are easily distributed over small price or productivity increases, or because fringe benefits are cut instead of employment levels. Less work has been done on the impact of the minimum wage on these outcomes than on the employment impact. Alternatively, disemployment effects might be avoided due to reduced fixed hiring costs as a result of lower turnover." "It, and it alone, should label him forever as someone not to be trusted to analyze any economic matter, including the economics of minimum-wage legislation." Strong words coming from a guy that just a year ago (in an op-ed written with grad student Liya Palagashvili) was adamant that we should expect from theory that the market "links pay to productivity," which throughout the op-ed is the same BLS measured average product that Reich is referring to! 2015 Don is right about theory. 2014 Don and Liya are right about empirics. This combination is a point in favor NOT of the idea that wages are determined by average products, but of the idea that the production function is something like Cobb-Douglas. When accounting for all compensation (not just wages) the labor share stays fairly constant and when accounting for compensation and deflating the nominal figures correctly average product grows with wages (which are equal to marginal product). These are both properties of a Cobb Douglas production function (although Bob Murphy has a really nice post on how other functional forms could produce a divergence between average product and wages that many people allege is happening). I love this graph. 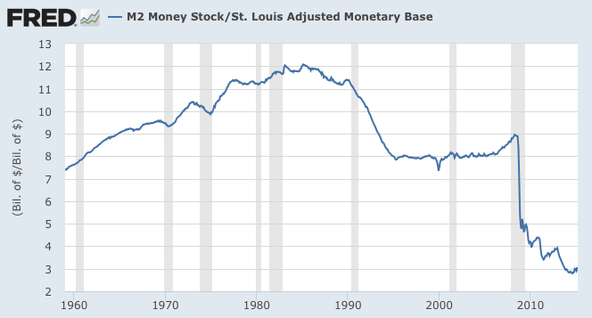 When you just graph the monetary base you give the impression that the Fed is (1.) in complete control and (2.) very expansionary. It takes careful argument to walk people back from each of those impressions. Depending on who you're talking to you usually only get halfway through convincing them that the last one is not true and don't make much progress at all on the first one. Market monetarists are weirdos that get that the second one isn't true but maintain adamantly that the first one is true - practically tautologically in some cases. When you put M2 over the base it makes clear why the second one isn't true and strongly suggests that the first one isn't true either (unless you think there was some radical change in preferences on the part of the Fed at the beginning of the recession). My thoughts are with Baltimore tonight. The last time the governor called the National Guard out to respond to riots my dad was able to get out to his grandfather's farm in Baltimore County. Not everyone has that option, then or now. That governor was Spiro Agnew, fwiw. Soon afterward he got a VP slot on Nixon's ticket for his tough law and order stance. My great grandfather's constitutional convention vote failed shortly after too in part because it was perceived as too liberal and reapportioned too much power to Baltimore city and the DC suburbs. I've come across mixed reactions but some delegates think racial tensions and the riot killed it. Will Hogan be a VP? Probably not. And chances are that this will accelerate some reforms. But the riots sure didn't put Baltimore on a strong trajectory in 1968 and they're nothing but bad news now. I wish both the cops and the rioters well. I've already seen some celebration of harsh crackdowns, though. Hopefully this settles down quickly because escalation of any sort will not be for the better. Citizens' responsibility is to fight for justice and speak truth to power. Police and National Guard responsibility is to protect and serve. We need a great deal of both, I think. I wanted to highlight this post by David Henderson on the late Barbara Bergmann, much of which is a discussion of her writing on the wage gap. He promises more to come. One of the things I like about this post is that it shows how both sides have to be careful with wage regression interpretations when talking about the wage gap. David's criticisms of Barbara are very much along the same lines as my criticisms of guys like Mark Perry. (I am not deeply knowledgeable about what she's written on it, so to a certain extent I'm taking David's word on it but it's a very common way of talking about things). While I'm posting more on her, I'll also point out that Taylor and Francis is providing free access to a special issue of Feminist Economics on Barbara Bergmann this month. So download those pdfs before it's too late! Does anybody have experience with a distributed lag model for panel data? Does anybody have experience with a distributed lag model for a panel dataset? I'm getting this odd result where I'm trying a bunch of different lag lengths and no matter what I run the two longest lags have much bigger coefficients than the rest. So when I run with six lags, five and six have big coefficients but when I run with sixteen lags fifteen and sixteen do. I feel like this has to indicate something about the data structure and the model - it can't be real to always show that no matter what the lag length. I'm just not sure what it indicates. If it matters - I'm looking at size of apprenticeship programs in an unbalanced panel with lags of the unemployment rate. No lags of the dependent variable. "ABSTRACT: The 2014 Current Population Survey, Annual Social and Economic Supplement (CPS-ASEC) introduced major changes to the income questions. The questions were introduced in a split-sample design—with 3/8 of the sample asked the new questions and 5/8 asked the traditional questions. Census Bureau analysis of the 3/8 and 5/8 samples finds large increases in retirement, disability, and asset income and modest increases in Social Security and public assistance benefits under the new questions. However, despite the additional income, poverty rates are higher for children and the elderly in the sample asked the new questions. In this brownbag, we discuss the changes to the survey, the effects of the changes on retirement and other income, and describe how compositional differences among families with children in the 3/8 and 5/8 samples may explain the unexpectedly higher poverty rates in the 3/8 sample. The discussion has practical as well as theoretical importance, as researchers will have a choice of datasets to choose from when analyzing the 2014 CPS-ASEC data—the 3/8 sample weighted to national totals, the 5/8 sample weighted to national totals, a combined sample, and possibly also an additional file prepared by the Census Bureau that imputes certain income data to the 5/8 sample based on responses in the 3/8 sample." The CPS is typically not used to address inequality for all sorts of reasons, including the nature of the questions, coverage, and top-coding. But it still has income questions, and note that a recent redesign changes asset income reports. Of course if we were to use the CPS to think about some of Piketty's research questions, this change would be important. Moreover, if you wanted to use a consistent series from the CPS you would have to adjust the data to either move down the newer half of the series, or (probably preferably if this redesign represents an improvement) moving up the older half of the series. They do split samples discussed in the abstract so that you can understand the sort of adjustment that might be appropriate. This is what Piketty is doing too when he harmonizes several of the wealth inequality series, and he uses years when the data series overlap to develop the adjustment factors. The figure Murphy and Magness like to call the "Frankenstein graph" suggests that certain blocks of the series come from different datasets, but in reality Piketty is typically taking data from several datasets to provide a harmonized estimate (for example, combining the Kopczuk and Saez data and the SCF data). This is how you'd want to merge several datasets, and it's generally not "pivoting" between datasets or "overstating" them as Murphy and Magness put it. Anyone can criticize these sorts of data decisions, but it's a normal part of empirical work. If your criticism is just that the data decisions result in the conclusion that Piketty draws, that's not a very reasonable criticism. It's entirely circular: Piketty's conclusions are bad because his data decisions are bad. How do you know his data decisions are bad? Because they correspond to his conclusions! In the last sentence of the last post I alluded to the fact that things get more complicated when we move from caring about inequality to doing something about inequality. 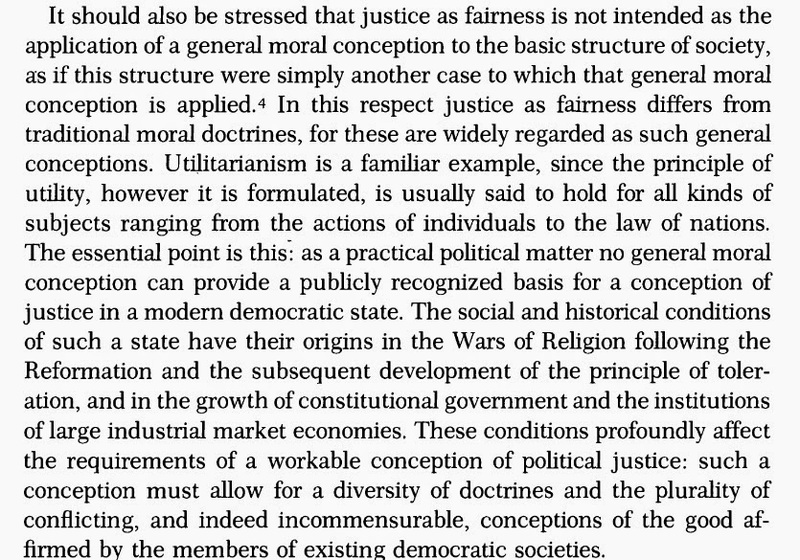 You can obviously never just use "fairness" to justify a policy solution not just because ends don't justify means (you have to know something about the ethics of the solution) but also because you have to demonstrate that there aren't other attendant ends that you don't want. A simple example is communism. We can dispute communism because the ends don't justify the means - the goal of equality does not justify violating property rights. But we can also dispute it on the grounds that in addition to making everyone equal it makes them miserable and poorer than they otherwise would be. Obviously both have a kernel of truth. Poverty matters a lot. We have been studying the "wealth of nations" for 250 years because poverty is critically important. We also rarely believe that it would be unfair for everyone to earn the same income. That point goes back to Aristotle at least. What matters is illegitimate inequality, and this is the sentiment that the second objection tries to piggy-back on. However, caring about poverty and corruption does not eliminate the case for concern about inequality that does not arise from corruption in a relatively wealthy society (e.g., most of the inequality Piketty writes about). We care about inequality because (1.) of our sense of fairness, and (2.) the fact that opportunities or capacities are unevenly distributed independent of any additional corruption that may exacerbate inequality further. As I write this it seems like a basic point. It feels a little silly to even make it. But I've seen both of the above objections with such frequency that I feel like I have to. So does dealing with this sort of inequality violate Aristotle's principle that the worst form of inequality is making unequal things equal (not that we are obligated to care of course)? It may, but it may not. There are two big problems with Aristotle's principle as I see it (I'm almost certainly reinventing the wheel here - I didn't take much philosophy so you can fill in the details if I am). First, I don't see why any ethical significance attaches to natural and/or random endowments of capacity or opportunity (if random shocks are a random draw by Nature, these can be considered together). I should hope this was obvious from about the time the words left Aristotle's mouth. In fact I should hope a couple sentences down he notes this and it just doesn't get quoted as much. The second reason why applications of Aristotle's principle are tricky is particularly relevant to Piketty and a capitalist economy: these systems are recursive and intergenerational, so one period's outcomes are the next period's opportunities. That's really the whole point of capital of course - it endures through periods of time and is productive in future periods. How do we think about Aristotle's principle in a recursive system? Is redistributing capital "making unequal things equal" or is failing to redistribute capital "making equal things unequal"? This is tricky enough in one generation because you have to distinguish between effort and luck of birth (assuming you agree with my first point that no ethical significance attaches to natural or random endowments of capacity or opportunity and therefore that redistribution in favor of those born into very unlucky circumstances is permissible). It gets very hard indeed when we move beyond one generation, because the choices of parents become the endowments of children. Poverty obviously matters but a basic sense of fairness justifies caring about this even in a rich, uncorrupt society. What we do about it of course compounds the difficulties for a number of well understood reasons having to do with behavioral responses.